My mother is an artist and we would color together constantly. She had such a perfectly beautiful way of making the pictures of flowers and birds look so lifelike, but the pictures of people were always my specialty. I would choose the pictures with the largest faces, because the lips and eyes were my favorite things to color as a child…and they are still my favorite things to color as a makeup artist. I have been experimenting with makeup since I discovered its existence and I would practice on anyone who would let me. I was designated the “Makeup Artist” by my friends long before I knew it would be my career. My girlfriends came to rely on me to do their makeup before they would go out on the weekends. It became my duty and responsibility to make sure my kit was well stocked with every imaginable color at all times. Of course, then my “kit” was a free Clinique bag exploding at the zippers with anything and everything I could fit in it. Since then not only has my kit grown, but so have I. Over the years, I have gained experience working with a variety of ethnicities and skin tones. Every woman is different and unique, so learning about each face was always something I looked forward to. I watched makeup become my passion and I thrived off the moment I was able to work on a new technique or a new face. 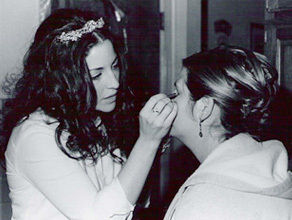 I even found myself doing makeup on my own wedding day when given the chance. I finally decided in 2005 that it was time my passion became my career. I obtained my certification from the Von Lee International School of Aesthetics and have been pursuing a full time career ever since. I believe in bringing out a woman’s natural beauty. I believe there are no rules in art and therefore no rules in makeup. I believe a smile is the best cosmetic you can own. I believe my job as a makeup artist is to see the beauty in you and bring it out for everyone else to see. I believe that women are butterflies, constantly transforming into more beautiful versions of themselves.